Although most experts say that wire hangers don’t do your clothing any favors, whenever I travel, I always pack two of the flimsiest wire hangers available. Sometimes I even use them for hanging clothes. 1. Once in a while I stay with families whose spare rooms have closets, but the closets are already so full of out-of-season or ill-fitting clothing, no hangers remain for my use. Bringing my own hangers allows me to unpack the outfit I plan to wear the next day. If the closets are really jam-packed, I use a ceiling hook, floor lamp, or handy wall protrusion for hanging. Any fabric wrinkles have a chance to relax overnight, and I don’t need to spend extra time in the morning trying to coordinate specific clothing items. 2. While hotel-room hangers never have the problem of bearing clothing left over from previous guests, there aren’t always enough hangers to go around, especially when roommates are along. I’m glad to be able to supply my own hangers and maintain group harmony. 3. What if you want to hang a garment somewhere in the room other than the closet, and that particular hotel’s hangers are the anti-theft kind where the wooden part separates from a loop permanently attached to the closet rod? You’re out of luck unless you have access to hangers with hooks—such as my wire ones. 4. Call me an introvert, but when I wash out lingerie in a hotel sink, I prefer not to leave it hanging in the bathroom for housekeepers to dodge when they clean. Instead, I do laundry at night and hang it from lightweight wire hangers hooked over the windowsill. Air blowing from the heating/air-conditioning unit below the window dries everything completely by morning. 5. 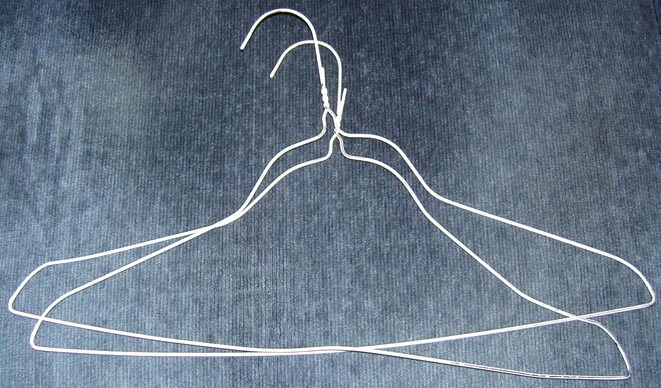 When selecting wire hangers for travel, be sure to choose flimsy ones. Not only does such construction add very little weight to one’s luggage, but the wire is also easier to bend into shapes or even break apart when you need to come up with MacGyver-like solutions to travel emergencies. Who knew that a flimsy wire hanger in one’s carryon could be so versatile? It’s one hang-up I never leave home without. This entry was posted in Pennywise Packing Pointers and tagged carryon, closets, clothes, flying, hangers, laundry, luggage, travel, wire hangers, wrinkle. Bookmark the permalink.